Before we moved from Florida, we got so caught up in the leaving that I have no impression at all of our last trip to the beach. We didn't take pictures, we didn't commemorate it in any way. And yet it was the Most Sacred Thing for me. The reason, above all other reasons, for being there at all. Things end while we are doing other things. I certainly don't recall the last time I used a diaper on any child in my house. The last time I guided a tooth brush over tiny teeth, the last time my oldest sat on my lap during church (He is ten. 5'2" and 95 pounds. It was not recently.) You don't know the last time you breast feed a child. You don't recognize the last time you speak to someone in person, or on the phone. Every ending is, by definition and experience, another beginning. This thing stops, that one takes its place. Or at least, we are trained to believe this. Lyrics and hindsight seem to confirm it. 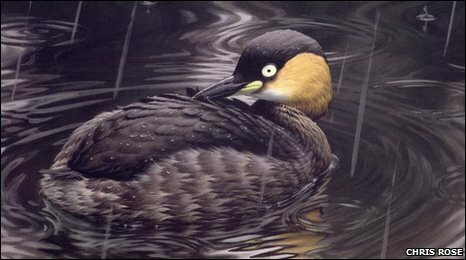 I was struck, this morning, by an artist's rendering of the Alaotra grebe, a bird, once in Madagascar. This bird was last seen in 1985. I wondered if in his birdy thoughts, in his small bird-brain, he looked around and felt lonely. I feel certain, as he was dying, he had no idea just how alone he was. To be the very last of his species. Or maybe he died with his mate, on their small pond, their weak wings never taking them to other ponds. Looking at the images of oil gushing into the gulf, I cannot help but wonder who else's end is now proscribed. What is going that will not be replaced? Who's lives - human and creature - are irrevocably changed, or destroyed altogether? What chain of events have been put into motion that cannot be reversed? I cannot fathom the greed, the speciesist (like 'racist,' for species. Is there a word?) thought that says - de facto, we are better. Might = right. Oil will gush until we figure out a way to save - not the creatures, the habitats, the whole life cycles - but the oil. It is, in a word I rarely use, sinful. It defines, for me, sin. We raise our children clumsily. Small lessons go missed, homework goes undone, days that should have order often disintegrate into chaos or murmers of mindless television. My only wish in that regard is that the things I say - my rants, my lectures, my late-night talks, stick in their back brains and form them in ways my clumsy day-to-day efforts sometimes don't. I wish, I hope, I pray at night, that when my own Littles are big and in charge, when they are running things or working for things or doing whatever it is they choose to do to Contribute, that they know Beauty. They promote it. They know Others. They see them, and they care for them. They know Work. They seek it. They see what they have, and they are Grateful. And they recognize Wrong, and work toward Right. Compassionate, passionate contributors. This - what is going on in the Gulf - what is happening to our beaches, marshes, lives - plant and animal and liquid - is Wrong. I often forget to pray. I forget prayer at all. But I never forget to appreciate, and am humbled by the imbalances I see in all things. It's not quite religion, but it is a tugging sense of duty and awareness - and I go to church on Sunday in the hopes that in the hour of silence that sense will come to the fore. Primum non nocere - The basis of the hippocratic oath. An oath, it appears, should ethically have been extended to far more than doctors. To bankers, businessmen, global energy companies. I am praying now for this to resolve. For life to go on, for the ocean to self-correct. I am praying for the impossible. I am praying that this will not mean the End of things we cannot begin to foresee or quantify. And I am praying for my children to pay attention, to think and see and absorb and carry forward to the next generation a sense of duty, compassion, passion, and heart-moving, soul-motivating, action-inspiring gratitude. you were once MY 'little'. I am so proud of the sensitive, compassionat, caring person you became--yours will become so too, I am sure! This is a fantastic post. Truly. And I do so understand those lost "last time" moments - the little stuff (am very grateful I didn't realize it was the last time I breastfed my child)and the big stuff (I can't remember the what I said to my mother the last time I saw her alive). Thank you so much for your words and for joining our Love the Gulf Blog Carnival. If only those who decided to drill in the first place had a "do no harm" motto. Because if they had, this leak would have been planned for and capped long ago. Thanks again, this is an excellent post.